Participants to the Oceania Oil Spill Workshop comprised of representatives from the United States, Fiji, Marshall Island, New Zealand, Tonga, Tuvalu and Samoa. Lieutenant-Colonel (LTCOL) Petero Talemaivatuwiri greeted participants and facilitators of the Oceania Oil Spill Workshop held at the Sofitel Resort on Monday 03 April, 2019. 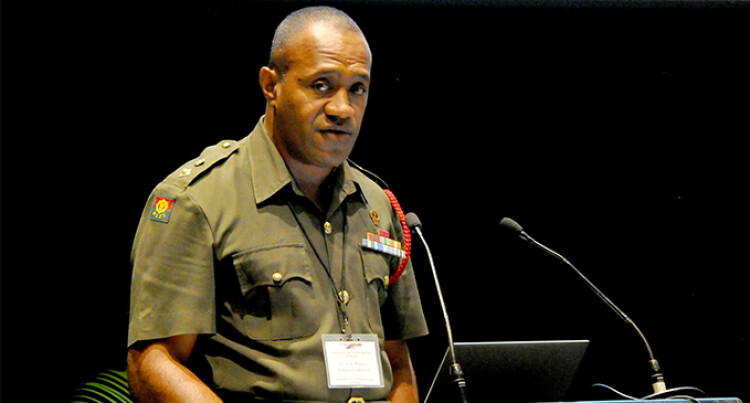 In his opening address on behalf of the Government of Fiji and the Commander of the Republic of Fiji Military Forces, the Commanding Officer of the RFMF Force Training Group in Nasinu stated that Fiji was gratified on the presence of the forty five participants including seven from the Oceania Region and thirty eight local participants during the opening ceremony of the workshop that was hosted by the United States Indo Pacific Command (USINDOPACOM). “Fiji is delighted to have all of you this morning and we are grateful to have the opportunity to co-host one of the very most important workshop, and that we are all aware of the risks and hazards that pose a great danger to maritime nations like ours,” LTCOL Talimaivatuwiri said. He added that all workshop participants should involve themselves in group discussions and share experiences that will improve future responses to crises like Oil Spill. LTCOL Talemaivatuwiri also acknowledged the efforts by the Oil Spill Workshop Secretariat and planning staff, Major Robyn Froehlich and Mr. Christopher Sholes of USINDPACOM, Mr. Quinton of PCII, Mr. Frank Marinkuwski, the facilitators and Presenters. He also expressed his appreciation on the ongoing engagement that the United States Government is pursuing with Fiji and most Pacific island Nations to enhance oil spill response capacity in the Oceania Region to protect marine resources and the environment.